The HP Split x2 may be the Windows 8 tablet/laptop that you've been waiting for if you've been waiting for a 13" high-powered Windows 8 tablet PC that attaches to a removable keyboard base. Don't get the HP Split x2 confused with the HP Envy x2 which is a smaller 11.6" tablet that's powered by an Intel Atom processor. You can use the Split x2 as a slate tablet PC. Or, attach the keyboard base that includes a built-in battery and you have a high-powered laptop that has very long battery life. 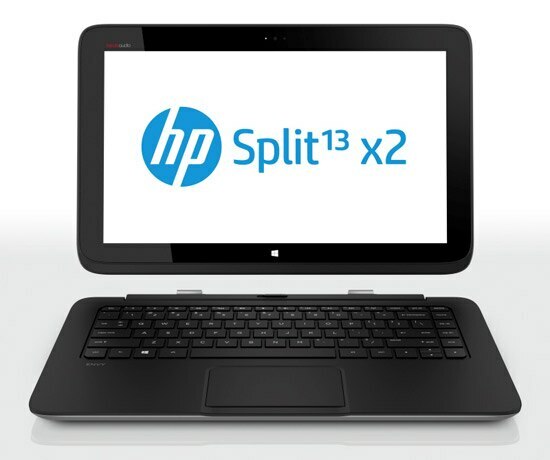 The Split x2 has a 13.3" screen and is powered by a 3rd generation Intel Core processor. So, if you've been looking for something faster than Atom, the Split x2 gives you that power. The tablet has a front webcam but lacks a rear webcam. Also, it's not clear to me if the tablet supports pen input. It doesn't appear to have a built-in silo for a pen. The keyboard base appears to have space to support an optional spinning hard drive which means you could carry an extra 500 GB of storage in the keyboard base.